The change of names was made due to the adaptation of our product portfolio. The portfolio will completely be concentrated on Baudisch products including its accessories. The company is a subsidiary of Baudisch Electronic GmbH. True to the motto “everything under one roof”, facilities for production, mechanics, EMC laboratory and a new office wing for sales and administration are laid out over 3600 qm and three floors. Groundbreaking ceremony for a new building. Baudisch Electronic extended development and production. StentofonBaudisch is a subsidiary company of established communication and security specialists Baudisch, Scanvest and Zenitel|Stentofon. Major expansion of the administration building with an additional floor and spacious premises. Further staff development. Final relocation of the CNC-division into the new production hall. Inauguration and commissioning of the new mechanics production hall. Expansion of the product range in the field of SIP-DoorStations. Successful new products such as RoomControl and other SIP terminals. Opening of house 3 with conference, training and exhibition rooms. Proprietary products for SIP communication are successfully placed on the market. Mechatronics projects on the basis of 3D design in SolidWorks. Commissioning CNC processing center Datron M8. Expansion of the SMD assembly capacity by the new Mimot Advantage. 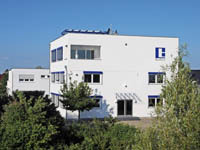 Acquisition of the EMC lab and staff of Invensys to Wäschenbeuren. Switching production to lead-free soldering. New selective solder. Order from Deutsche Post (DHL) for 100 intercom control centers with touch screen..
First Order from the European Central Bank in Frankfurt with the product ComPanel. Innovation Award of the district Göppingen for the first touch panel PC. Further staff growth to a total of 20 permanent employees. Renewed order from the Nürnberger Verkehrsbetriebe: Development of an electrical bus stop display. Project automation for Opel: Decentralized control of CPUs support systems. Automation of SMD assembly with Mimot 1260 machine. Completion and move into the second company building. Complete reorganization of corporate structures into defined areas: development, manufacturing, system engineering. Development contract in the field of transportation. Start of construction of a second production building. Major contract to develop a completely new electronics for door systems. Winning the ePortal competition from Hewi. Major order for the forerunner of the ComPanel. ( Abu Dhabi ), end-customer Deutsche Bahn. Change of name to Baudisch Electronic GmbH. Expansion of the manufacturing area. Start of construction and move into a new company building in the industrial area. Large order from Nürnberger Verkehrsbetriebe: 63 underground trains are equipped with the latest processor technology from Wäschenbeuren. Installation of the EMC test lab for immunity and emission tests. Hiring of the first permanent employees. Start of production of electronic test equipment for the Deutsche Telekom. Conversion of part-time company in a business enterprise. Purchase of a building, Hetzengasse 24. The company founded by Peter Baudisch. Previously as a part time activity. Move to Wäschenbeuren, Heuhof 3. Part-time contracts in the CAD layout design, CNC processing, the assembly of PCBs and programming. Formation of Peter Baudisch in Uhingen/Fils on a part-time basis. Areas of operations are the development of electronic circuits and software as well as equipment manufacturing.